A beautiful bright red homemade elixir of raspberries, sugar and vodka. 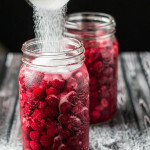 This raspberry liqueur is so easy to make and well worth the effort! Split the bottle of vodka evenly between the two mason jars. Add one bag of frozen raspberries to each jar. Add 1 cup of sugar to each jar. Put the lid on the jar and store in a cool dark place for a couple of months, giving it a shake every once in a while.